As a specialist in process controls, my company offers comprehensive temperature uniformity surveys. Through years of training operators and helping companies work on temperature uniformity survey procedures, I have found one of the sticking points in meeting compliance standards involves thermocouples. Without proper assembly, use and placement of thermocouples, temperature uniformity surveys cannot succeed. When working to ensure compliance with requirements of standards such as AMS2750E and Nadcap, pay close attention to temperature uniformity survey procedures for thermocouples. Most operators know the acceptable work zone size and qualified operating range, but furnaces—whether new or used—rarely work exactly as promised. We must carefully measure every square meter of the furnace control zone to ensure compliance, which is why the initial temperature uniformity survey is so important. Determining effective work zones will allow you to maximize capacity and efficiency on each cycle. Initial survey temperatures shall be the minimum and maximum temperatures of the qualified operating temperature range(s). Additional temperatures shall be added as required to ensure that no two adjacent survey temperatures are greater than 600 degrees Fahrenheit (335 degrees Celsius) apart. For a furnace that processes production hardware from 900 degrees Fahrenheit to 2200 degrees Fahrenheit, an AMS2750E test would start by testing at 900 degrees Fahrenheit and finish by testing 2200 degrees Fahrenheit. 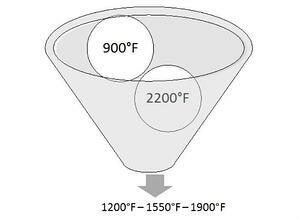 The supplier would need to select temperatures between 900 and 2200 degrees Fahrenheit to ensure that there is no more than a 600 degree Fahrenheit gap between each adjacent temperature. Figure 1 is an example of temperatures that could be selected. The conditions that an initial temperature uniformity survey is required include a) the furnace is installed (new or used) and b) when any modifications are made that can alter the temperature uniformity characteristics. Note that “b” covers a number of issues, such as survey failures that result in repairs, expansions of the qualified work zone, installation of thicker control thermocouples, etc. 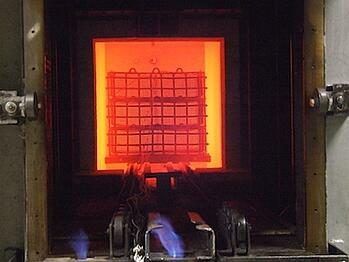 These surveys cover a single operating range greater than 600 degrees Fahrenheit. In this case, the temperatures must be 300 degrees Fahrenheit from the minimum and 300 degrees Fahrenheit from the maximum-qualified operating range. 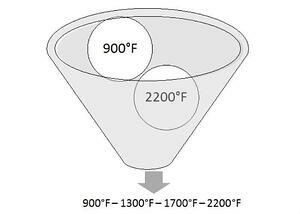 If there is a gap of greater than 600 degrees Fahrenheit, additional temperatures must be selected so there is no gap greater than 600 degrees Fahrenheit. Using the prior example, we could select temperatures as stated in Figure 2 below. At least once each calendar year, the minimum and maximum temperatures of the qualified operating range must be tested. Some suppliers may also choose to perform an initial temperature uniformity survey once per year to ensure they capture the minimum and maximum. Tables 8 and 9 in AMS2750E describe the temperature uniformity survey frequency, which is based both on furnace class and instrumentation type. If our example furnace was Class 3 (±15 degrees Fahrenheit) with Type A instrumentation, the initial survey frequency would be quarterly. After two successful consecutive surveys, the frequency of testing could then be extended to being done annually. Initial and periodic survey temperatures and initial and periodic survey frequency are not the same. Using the example furnace, the supplier would perform a temperature uniformity survey using initial temperatures shown in Figure 1. If the survey passes, the supplier would perform a survey using the temperatures shown in Figure 2 three months later. This would count as two consecutive successful surveys and would allow the next survey to be performed annually using the temperatures stated in Figure 2. Interested in learning more? We conduct AMS2750E training courses which provide individuals with a better understanding of AMS2750 and Nadcap requirements. Contact Conrad Kacsik today.